The open-world space genre is an expansive category that encompasses elements of gameplay from many different genres such as building, survival, crafting, and trade. 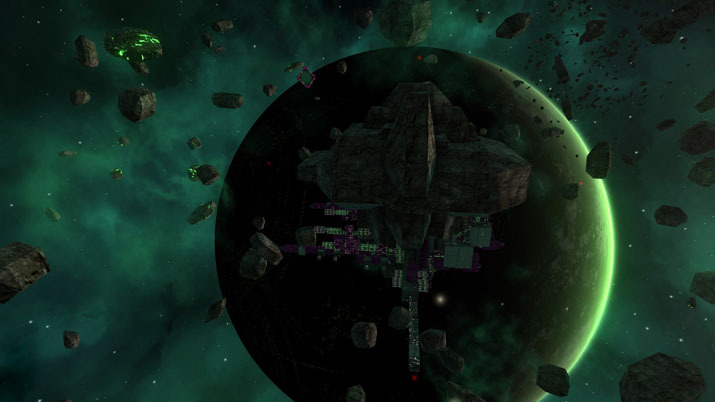 Many members of the open-world space genre tend to focus their attention, and engines, on one or two specialties, but Avorion and the developers at Boxelware have instead opted to give the player as many choices as possible. Throughout the game, you are enveloped in colorful, open space. Each new solar system seems unique, and you are treated with beautiful scenes – luscious bursts or colorful, wispy hazes – through which you can pilot your craft. Each player starts as a single mining drone as Boxelware walks you through the tutorial, which is incredibly well thought-out for a building game in Early Access. I don’t think I’ve seen such a methodical tutorial, and before launch day, no less. In the tutorial, you’ll build a larger ship and jump to a new sector and back, getting a feel for the breadth of Avorion. After you’ve completed the tutorial, you’re presented with the first bit of story, and an incentive to guide you through the game; a well-seasoned traveler talks to you for a bit about a new material, “Avorion,” but it’s near the center of the universe, which means it’s impossible to reach. Naturally, now you want to find a way to venture straight to the center of the universe. You can spend your time in sectors near where you start, which will have plenty of ore, or you can begin to venture closer to the center of the universe, but there’s lots of ground to cover. 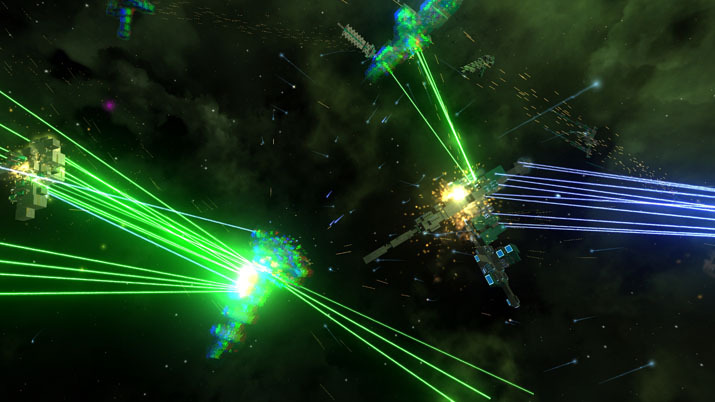 When you mine iron to build your ship, pirates will inevitably attack your present sector, and you can choose to defend the sector, or go about your merry business. When fighting and destroying other ship types, you can pick up power-ups – parts such as new cannons – which you can mount on your ship or sell to help you along on your journey. As you get closer to the center, you’ll begin to find better building materials. Near the outer edges, you will find Iron and Titanium, but there are seven types of materials in total, each one stronger than the last. While you’ll find that titanium has only one-and-a-half times the hit points of iron, Avorion is roughly eleven times stronger. 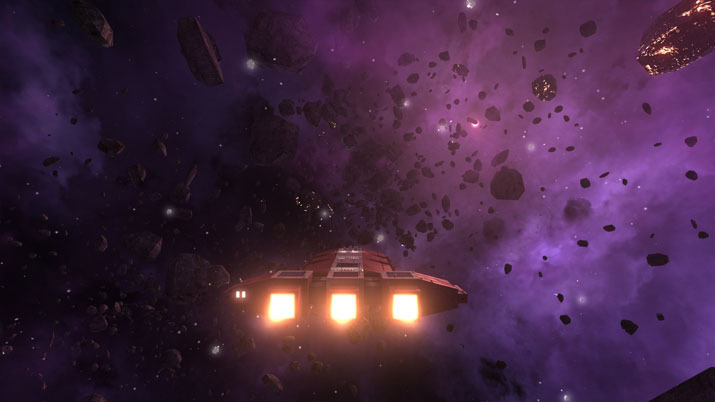 In Avorion, you are free to find what you like to do and pursue it. If mining all day is cathartic, then grab your pickaxe and have at it. If exploration is your jam, then the universe is your oyster. If you like trading between outposts or running down pirates, then you will also find satisfaction for that capitalist or bounty hunter itch, and you can bring your friends along with you; Avorion supports multiplayer, even in Early Access. While building your ship early on, you’re limited to a small selection of parts, and their shapes will stay the same despite the material used. However, new materials unlock new parts – you can construct a shield generator with Titanium, but not with Iron – so it makes sense to go out looking for new resources. Fortunately, Boxelware has included part-copying and resizing into the game, features which allow players to focus more on gameplay and less on mindless repetition. Perusing the parts library evoked memories of the early days of Space Engineers. Though Avorion facilitates the construction process, as you’re operating more at a macro-level, the trade-off is the loss of a bit of personality and customization options. For example, when you place engines on your ship, they will always point astern and always propel the ship forwards. “Thruster blocks” provide all other kinds of movement, including rear, or brake, thrust. The more of these blocks you have, the more responsive your ship will be… but you have no explicit control over the brakes. When you lift your finger up off the forward command, you immediately start to brake; these controls – or lack thereof – were frustrating. If your thruster blocks were numerous, you would slow down too fast, and you were left hoping that the weightless inertia of space would carry you to your destination. On the other hand, if you needed to slow down and your thrusters weren’t powerful enough… well, get ready to turn your ship around and thrust in the opposite direction. This isn’t an oversight; in the tutorials, the rear thrust controls are explicitly spelled out to act exactly in this capacity. It feels cumbersome when it seems that you should be able to easily put larger rear thrusters to use only when you need them. Smashing into an asteroid and tearing apart most of your engines while trying to turn around and thrust in the opposite direction is not fun, albeit a bit hilarious. When moving close to stations, you have options: you can trade goods, sell mined resources, or hire essential crew members. However, you won’t know if you’re close enough until you try to select the station and get an error. So, you may have to try a few times, but don’t get too close – remember, if your brake thrust isn’t high enough, you will crash into the station. I know, because I've done it. This game is incredibly ambitious, and what they have for an Early Access launch is full of promise. Boxelware is throwing together many aspects of the open-world space sims and combining the result with the ‘building’ genre that is all the rage these days. Avorion has a lot of potential, and Boxelware must be very diligent to balance the game so that players enjoy a consistently good experience across the different styles of play that this title allows.